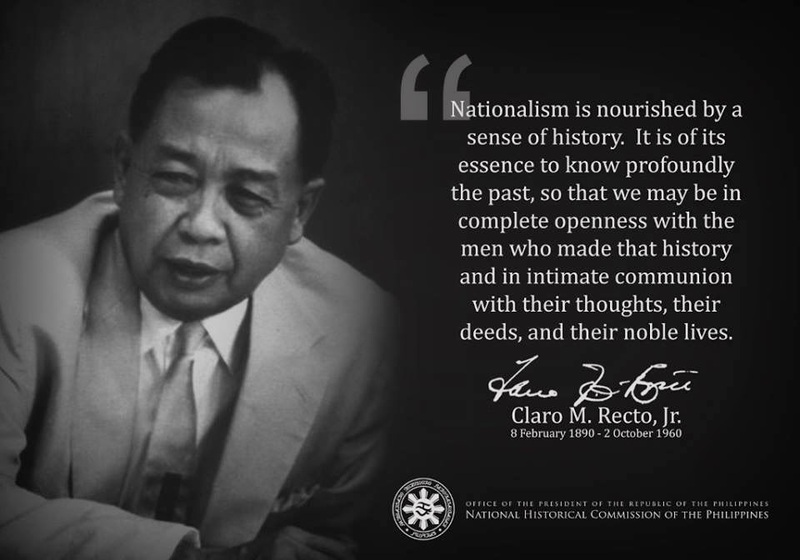 What We Filipinos Should Know: To those who wonder "why dig the past": We engage in revisiting and revising our past, i.e. historical "revisionism", to develop new emphases and raise new questions on assumptions and explanations for key historical issues and policies --given by our former colonial master America, government officials and authors of history books, then and now. PS. Note the right of Britons who commit crimes to be tried only by Western courts. Rings a bell? Japan more than most countries depended heavily on trade, and so Japan was eager to acquire a colonial empire of its own so it too could help its domestic industries by squeezing third world people to enrich itself. The Japanese went into Manchuria, in northern China, in the early 1930s. And that was one source of tension between the United States and Japan because the United States attitude towards China was an attitude established at the turn of the century when the United States announced the Open Door Policy, a policy which said that none of the great powers should colonize China. Britain was beginning to think about it, and Japan was beginning and Germany and Russia were thinking about it, and the United States announced that none of the powers should colonize China. China should be left independent. Translation: China should be open to the exploitation of all the great powers, not to just one or two of them. The proof that this is what the Open Door meant is that the United States and the other great powers got all kinds of special privileges in China, and these would be maintained until the middle of World War II. Let's go back to the middle of the 19th century. The British were selling opium in China. Most Chinese officials are very corrupt, but in one port the Chinese official tried to interfere with the British sale of opium, and so naturally the British went to war against China. It was simply unacceptable that a Chinese official would try to interfere with British profits, so Britain went to war against China -- this is known as either the first Anglo-Chinese War or the First Opium War -- and when the smoke cleared, Britain got a bunch of privileges, and then a couple of years later, they did the same thing again in and there was a second round of this war, and as a result of this, Britain got Hong Kong; Britain got the right to sell what they wanted to sell in China; Britain got the right to have its merchants and traders go into any part of China they wanted without having to abide by Chinese laws, and they got the right that Britons, should they commit crimes, would not be tried by Chinese courts but rather would be tried by a Western court in Shanghai. And as soon as the British got these privileges, all the other Great Powers demanded the same privileges. The Chinese government thought -- and maybe it was right -- that it was better to give the rights to everyone because if just one country has these rights, they might try to colonize China; better to spread it out and let them keep each other in check. So in Shanghai, there was actually an international settlement set up ruled by a western consortium, and if you were a westerner who committed a crime in China, you would be tried before this court. As part of these privileges, the United States and other countries had their gun boats sailing up and down Chinese rivers. This is not what you usually do in an independent country. If you'll notice there are no German military boats sailing up and down the Mississippi River. That's because we're an independent country, but China was essentially a neocolony of the Great Powers. Well, when we get to the 1930s and Japan starts moving first into Manchuria and then after 1936 into China proper, Japan is coming into conflict with U.S. business interests and U.S. investment rights, the rights that we extorted from China. And sure enough, as the Japanese do their terror-bombing of the Chinese population, they occasionally hit some American property or some American gun boat, and this gets the United States very upset, but the key thing here is that the United States wasn't concerned about Chinese sovereignty. What the United States was concerned about was U.S. rights to exploit China on an equal basis. After 1936 Japan is in a full-scale war with China, and their rhetoric in this war is the same kind of rhetoric the U.S. used in Vietnam. That is we're here fighting communism because there are communists in China. We're here fighting communism. We're not doing this for any selfish reasons. We just want to get rid of these evil communists from Chinese soil. A lot of trade still went on with China and came into China through the French colony of Vietnam and other places, and so eventually the Japanese moved into Vietnam in order to cut off trade with China that way, and the United States protested again that this was interfering with U.S. trade. The Japanese terror-bombed the Chinese population, and U.S. officials with great indignation explained that it is immoral and unacceptable to attack civilians during the course of a war, and bombing them from the air is something that offends the moral core of humanity. Japan and the United Sates had negotiations. The United States - most of the negotiations were over U.S. business interests in China. Japan said to the United States, okay look, you've got a Monroe Doctrine for Latin America. You essentially said: rest of the world, keep out of Latin America. So we would like to have our Asian Monroe Doctrine in the same way. But the United States said, no, you can't do that. We, the United States, are entitled to a Monroe Doctrine in Latin America, but you're not entitled to one in Asia. And so what happened was that the United States started increasing its sanctions on Japan. They cut off oil trade with Japan. U.S. allies, Britain and the Netherlands, also cut off oil trade with Japan. The Netherlands at that time was a government in exile living in London, but they still controlled what is today Indonesia, which was then called the Dutch East Indies, and they were a major oil producer, a major source of Japanese oil, and so the United States cut off Japanese oil, and now the question confronting Japanese policymakers was what do you do? Do you pack it all in, call all your troops home from Japan, or do you seize the oil that you need?